The Somerville Public Schools strives to promote social, emotional, mental, physical, intellectual and environmental well-being through a collaborative approach across departments. The District Wellness Coordinator, Caitlin Kelly, supports well-being throughout the district by coordinating policy, practice, programming and promotion in collaboration with school and city departments, the District Wellness Committee, Wellness Champions at each school as well as community partners. WSCC is a collaborative approach to learning and health. The focus is directed at the whole school, with the school in turn drawing its resources and influences from the whole community and serving to address the needs of the whole child. Download more 95210 Materials for tips on healthy living. 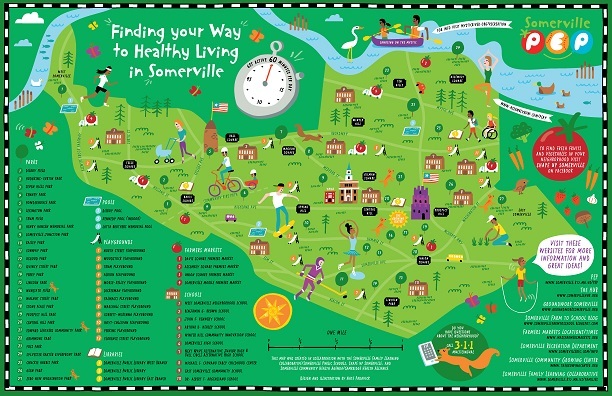 Download the Healthy Living in Somerville Map to find parks, pools, libraries, farmers markets, schools and more local places to get active with your family.